← Online Reviews – Yea or Nay? I’m home today with my daughter who has strep throat. 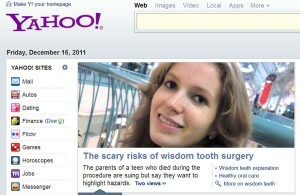 A few moments ago, my wife (on her way out to work) told me that there was a headline on Yahoo.com about someone dying from wisdom tooth surgery. Oh boy. Here we go (again). More bad press for dentistry. The story is actually by ABC News. And, it describes a case of a 17 year old girl dying of complications during 3rd molar surgery. Hypoxia was ruled as the cause of death. 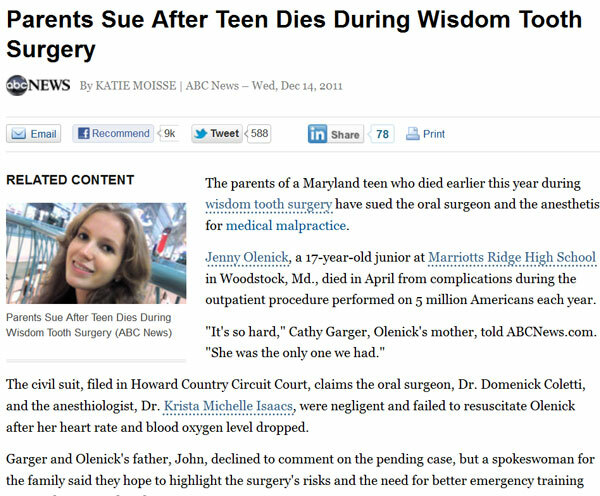 The family is suing the oral surgeon and the anesthesiologist. I thought it was interesting that an oral surgeon was employing an anesthesiologist in his private office. Most of the surgeons I know perform conscious IV sedation themselves. At any rate, the details are missing from the story, as I would expect from the media. Click on the image to read the story online. 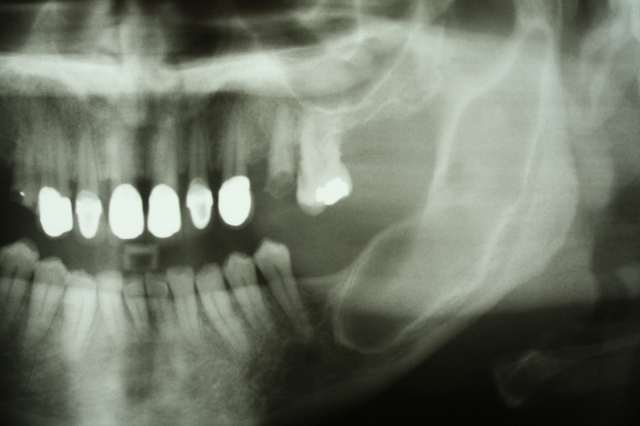 The article goes on to contrast the differences in opinions on prophylactic 3rd molar removal. It pits the American Association of Oral and Maxillofacial Surgeons against the American Public Health Association. And, of course, the article brings up the financial incentives for performing 3rd molar surgery. Yes, of course… it’s all about the money. 🙁 Billions of dollars. That said.. personally, I don’t agree with routine prophylactic removal of impacted third molars. Each case should be examined on an individual basis considering many factors. But, with a complete absence of pathology, I’ll usually recommend watchful waiting (with periodic panoramic films). No doubt, in my nearly 25 years of practice, I have found some “aardvarks.” Pathology DOES happen. And at the first sign of it, we SHOULD act. Pathology DOES happen! Click image to link to article. We’re all still knuckle-dragging troglodytes. Really? I must have slept through that lecture in dental school. But, I think if my 3rd molars (waaaaaay in the back of my mouth) had managed to latch onto some “uncooked prey,” I’ve already caught the poor critter with either my HANDS or perhaps even my front teeth (canines) like would a saber-toothed cat. Silly! Certainly, any death from medical or dental complications is tragic. And, I cannot imagine the grief of the parents. Unbearable. If I’m to assume the article’s statistics are correct (11,000 cases of complications out of 5 million patients), it comes to 0.2% morbidity. While I don’t know the details of what happened in this case, it sounds like something went seriously wrong. And, it’s entirely possible it was due to negligence. I just don’t know. Just 2 weeks ago, I had a LONG drawn-out conversation with a patient about possible complications of extraction, including paresthesia. She and her husband really got hung up on the possibility of paresthesia. In this case, it was an erupted 3rd molar that was grossly decayed and painful. But, the root tip was radiographically superimposed on the IAN. I wasn’t too concerned about it. But, the patient was concerned. Of course, in this case, the alternative was to leave the infected tooth in place (and suffer THOSE consequences). After much discussion, she agreed to go ahead. The tooth was extracted uneventfully. In 2000 – 2002, medical errors in hospitals leading to death AVERAGED 195,000! Don’t think that didn’t concern me when I went in for my appendectomy. I was VERY concerned. I realized that I’m about 16 times as likely to be killed by a hospital as by a violent criminal with a gun. I didn’t like those odds! But, it is what it is. Without the surgery, I’d be dead for sure. Yeah… we need more “gun control” laws, eh? Let’s address the REAL issues, OK, you nincompoops in Washington?? Oral Surgeons have a lower rate of complications from anesthesia and sedation than board-certified anesthesiologists. As a matter of fact, anesthesiologists have a mortality rate THREE AND A HALF TIMES HIGHER than oral surgeons. The dental profession is a popular punching bag. That’s not to say that we shouldn’t do everything possible to avoid tragedies like this case. As a dentist AND a parent, I find it alarming and very sad. But, as professionals, besides keeping our training and competence up to snuff, we must keep things in perspective. A 0.2% rate of complications is amazingly low. Whether it’s mercury poisoning, BPA poisoning, fluoride poisoning, cavitations from extractions, focal infections from root canals, x-rays, or whatever controversial topic seized upon by the media… we must be ready to calmly, rationally, and happily explain things to patients who ask questions. PS… if you want to see sobering evidence of a DIRE need for public education about dentistry and dentists, read the comments after the ABC News article. Epic ignorance! This entry was posted in Current Events, Editorial and tagged anesthesia, dental patient death, dental surgery complications, in the news. Bookmark the permalink. Great Article Mike. I really enjoy reading your blogs/thoughts on dentistry. I am going to print you BLOG article off and give it to my staff. So they can be prepared for the questions come Monday!! First up, excellent writing. It’s always wonderful to hear the refreshing perspective of someone who actually is in the business of taking care of people, rather than the sensationalists looking for people to flock to a story. As they say, there are always three sides to a story. That being said… it’s kinda unfair to suggest that oral surgeons performing sedation is safer than anesthesiologists performing sedation using that particular set of data you’re quoting. You and I both know that if a patient is sick enough, even the oral surgeon will take a patient to a hospital (which is where the anesthesiologist data you quote is from). Hospitals get sicker patients, having more complicated procedures. It’s a little unfair to compare the healthy 18-year-olds having wisdom teeth pulled to great grandma having a double heart valve replacement. I still agree, however, that having sedation by an oral surgeon in the office is perfectly safe. I’ve worked with many, and they’ve been some of the best clinicians I know and have been trained to take care of the sedated patient. I say this while also recognizing that a good oral surgeon also knows his/her limitations and, in my experience, will appropriately defer what would usually be an outpatient procedure to a hospital setting if clinically appropriate. Thanks for your comments and compliment. My point is (and you agreed) that oral surgeons are perfectly qualified to perform anesthesia. Point taken about the relative health (ASA classification) of patients in the hospital vs. the oral surgeon’s office. However, down here in S. Florida, I’d say the oral surgeons see a higher number of compromised (elderly patients). The vast majority of my referrals to the oral surgeon are geriatric patients. Some have one foot in the grave and the other on a banana peel! I turf’em to the surgeons. My implication wasn’t that it’s “safer” to be sedated by an oral surgeon (than an MD). The point is that oral surgeons have a STELLAR safety record. And, they do. Sooo, I must take a moment to appreciate your comments; and weigh in on the other side. First, most surgeons agree that removal of third molars are easier prior to complete root development. The surgery is easier, the extraction is less traumatic, and for the most part, the time of the procedure is shorter. So, if one waits for pathology to develop, then you are likely causing a much more complicated and risk-laden procedure. Second, I worked for a short time in an Aspen Dental office. They are extraction mills . Every day, I had elderly, sick, poor people come into the practice who had retained third molars that were nasty periodontally infected and grossly carious. I would venture to say, that in my recollection, I did not have ONE patient above the age of 75 who was disease free around a third molar. And, most came specifically for emergencies involving these troublesome teeth. I always look at my patients as if they will be with me for the entirety of their lives. And in my thirty years of experience, my dentistry has led me through many learning cycles. I would say that given my specific set of dental experiences, that early intervention extraction of third molars, in the healthy individual, is a pro-active, healthy option for any patient.